Last time we defined the Hamming code. We also saw that it meets the Hamming bound, which is a measure of how densely a code can be packed inside an ambient space and still maintain a given distance. This time we’ll define the Reed-Solomon code which optimizes a different bound called the Singleton bound, and then generalize them to a larger class of codes called Reed-Muller codes. In future posts we’ll consider algorithmic issues behind decoding the codes, for now we just care about their existence and optimality properties. Recall that a code is a set of strings called codewords, and that the parameters of a code are written . Remember is the length of a codeword, is the message length, is the minimum distance between any two codewords, and is the size of the alphabet used for the codewords. Finally, remember that for linear codes our alphabets were either just where , or more generally a finite field for a prime power. One way to motivate for the Singleton bound goes like this. We can easily come up with codes for the following parameters. For the identity function works. And to get a -code we can encode a binary string by appending the parity bit to the end (as an easy exercise, verify this has distance 2). An obvious question is can we generalize this to a -code for any ? Perhaps a more obvious question is: why can’t we hope for better? A larger or ? Because the Singleton bound says so. Theorem [Singleton 64]: If is an -code, then . Proof. The proof is pleasantly simple. Let be your alphabet and look at the projection map which projects . Remember that the size of the code is , and because the codomain of i.e. has size , it follows that is not an injective map. In particular, there are two codewords whose first coordinates are equal. Even if all of their remaining coordinates differ, this implies that . It’s embarrassing that such a simple argument can prove that one can do no better. There are codes that meet this bound and they are called maximum distance separable (MDS) codes. One might wonder how MDS codes relate to perfect codes, but they are incomparable; there are perfect codes that are not MDS codes, and conversely MDS codes need not be perfect. The Reed-Solomon code is an example of the latter. 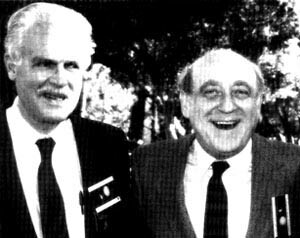 Irving Reed (left) and Gustave Solomon (right). The Reed-Solomon code has a very simple definition, especially for those of you who have read about secret sharing. Given a prime power and integers , the Reed-Solomon code with these parameters is defined by its encoding function as follows. A message is a list of elements . Represent the message as a polynomial . The encoding of a message is the tuple . That is, we just evaluate at our chosen locations in . Decoding the message is a bit more difficult (more on that next time), but for now let’s prove the basic facts about this code. Fact: The Reed-Solomon code is linear. This is just because polynomials of a limited degree form a vector space. Adding polynomials is adding their coefficients, and scaling them is scaling their coefficients. Moreover, the evaluation of a polynomial at a point is a linear map, i.e. it’s always true that , and scaling the coefficients is no different. So the codewords also form a vector space. Fact: , or equivalently the Reed-Solomon code meets the Singleton bound. This follows from a simple fact: any two different single-variable polynomials of degree at most agree on at most points. Indeed, otherwise two such polynomials would give a new polynomial which has more than roots, but the fundamental theorem of algebra (the adaptation for finite fields) says the only polynomial with this many roots is the zero polynomial. So the Reed-Solomon code is maximum distance separable. Neat! One might wonder why one would want good codes with large alphabets. One reason is that with a large alphabet we can interpret a byte as an element of to get error correction on bytes. So if you want to encode some really large stream of bytes (like a DVD) using such a scheme and you get bursts of contiguous errors in small regions (like a scratch), then you can do pretty powerful error correction. In fact, this is more or less the idea behind error correction for DVDs. So I hear. You can read more about the famous applications at Wikipedia. The Reed-Muller code is a neat generalization of the Reed-Solomon code to multivariable polynomials. The reason they’re so useful is not necessarily because they optimize some bound (if they do, I haven’t heard of it), but because they specialize to all sorts of useful codes with useful properties. One of these is properties is called local decodability, which has big applications in theoretical computer science. Anyway, before I state the definition let me remind the reader about compact notation for multivariable polynomials. I can represent the variables used in the polynomial as a vector and likewise a monomial by a “vector power” , where is the degree of that monomial, and you’d write an entire polynomial as where ranges over all exponents you want. The message is the list of multinomial coefficients of a homogeneous degree polynomial in variables, . You encode a message as the tuple of all polynomial evaluations . Fact: Two multivariate degree polynomials over a finite field agree on at most an fraction of . For messages of desired length , a clever choice of parameters gives a good code. Let , , and pick such that . Then the Reed-Muller code has polynomial length , and because we get that the distance of the code is asymptotically , i.e. it tends to . A fun fact about Reed-Muller codes: they were apparently used on the Voyager space missions to relay image data back to Earth. So we defined Reed-Solomon and Reed-Muller codes, but we didn’t really do any programming yet. The reason is because the encoding algorithms are very straightforward. If you’ve been following this blog you’ll know we have already written code to explicitly represent polynomials over finite fields, and extending that code to multivariable polynomials, at least for the sake of encoding the Reed-Muller code, is straightforward. The real interesting algorithms come when you’re trying to decode. For example, in the Reed-Solomon code we’d take as input a bunch of points in a plane (over a finite field), only some of which are consistent with the underlying polynomial that generated them, and we have to reconstruct the unknown polynomial exactly. Even worse, for Reed-Muller we have to do it with many variables! We’ll see exactly how to do that and produce working code next time. This entry was posted in Coding Theory, Combinatorics, information theory and tagged coding theory, information theory, reed-muller code, reed-solomon code. Bookmark the permalink.